The Companion Card Program enables people with disability who require life-long attendant care support from a companion to attend participating venues or activities without incurring the cost of a second ticket for their companion. Support greater social inclusion for people with a disability and their carers. Provide businesses with a practical way to meet some of their obligations under anti-discrimination legislation. The Companion Card is a credit-card sized photo ID card issued to people with a significant disability who require attendant care support from a companion to participate at venues that have signed on as a participating Business Affiliate. Cardholders present their Companion Card when booking or purchasing a ticket from a participating Business Affiliate. The Business Affiliate will recognise the Companion Card and issue the cardholder with a second ticket for their companion at no charge. 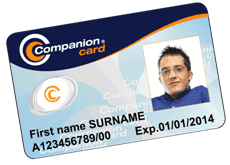 The ACT Companion Card is not a discount, benefit or concession card and is not subject to income or means testing. The ACT Companion Card Program was commenced in 2009 and is recognised nationally in all States and Territories. The ACT Companion Card Program is an ACT Government initiative administered by the Community Services Directorate (CSD), in partnership with Access Canberra, under a licensed agreement with the Victorian Government. The Companion Card was first introduced by the Victorian Government in 2003 as a response to concerns from people with disability that the pricing policies of some entertainment, leisure and recreation venues were discriminatory. People with a disability, who require attendant care support, are often required to pay two admission fees (one for themselves and another for their companion) when, without the support of the companion, they would not be able to participate at the venue or activity. The Companion card was developed to remove this barrier. The ACT Government is committed to ensuring people with disability have the opportunity to participate equally in community life and has adopted the Companion Card Program as a further way of upholding this right. The program is endorsed by both the ACT and Australian, Human Rights Commissions.